Moab Brand trails offer a wide variety of trails for the beginner, intermediate, and advanced rider. Many of the trails offer outstanding views of Arches National Park. Riders looking for longer distance single track riding opportunities should check out the Klondike Bluff area, in 2011 the BLM and Grand County Trail Mix began construction of 12 miles of new singletrack trails in the Klondike area. The new trails total 32.9 miles and bring the total trail mileage in that area to approximately 50 miles. 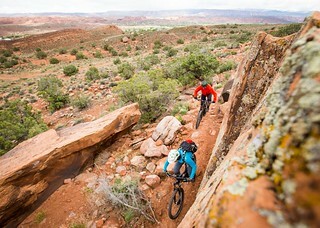 Those looking for a more challenging experience should check out Captain Ahab trail, which has become a world-wide draw for the unique technical rock challenge that the trail provides. Photos by Leslie Kehmeier, Mapping Manager, International Mountain Bicycling Association.